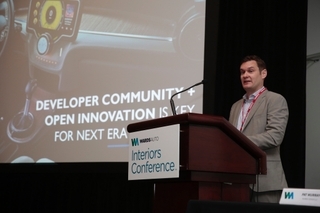 For the third year in a row, HARMAN presented at the WardsAuto Interiors Conference in Detroit on May 30. The conference brings together top OEMS, suppliers and technology companies to exchange ideas around vehicle interior design and the ever evolving in-car experience. 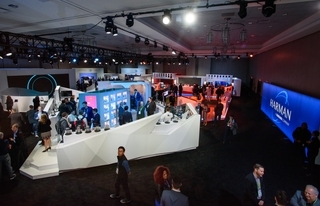 In addition to keynotes from head designers at GM and FCA, dozens of industry experts participated in breakout discussions on topics spanning materials innovation, autonomous environments, the cockpit of the future, noise management and user experience, among others. VP of EPIC (Early Pursuits with Innovative Concepts) Experience, Chris Ludwig and Philipp Siebourg, Car Audio Design Director for Huemen, HARMAN’s in-house design agency, delivered presentations and brought a unique audio-centric perspective to their respective panel discussions. Speaking on a panel entitled “Creating the Ultimate User Experience,” Chris discussed how software has become the key driver of new in-car experiences and stressed the importance of open platforms to drive innovation. He discussed HARMAN’s new open car audio platform called AudioworX and how it is enabling a broad community of outside developers, OEMs and engineers to deliver differentiated in-car experiences. He also spoke about why this is crucial for automakers to remain competitive in the face of new mobility trends and autonomous vehicles. He closed with some examples of how car audio has moved beyond traditional sound in the software era, enabling better in-car communication, improved driver awareness, and passenger wellbeing, among others. For more details on the other presentations and key takeaways from the User Experience panel, check out this coverage in WardsAuto. 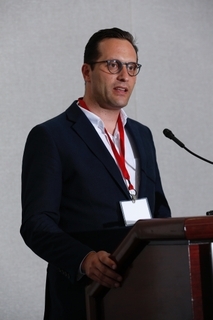 Philipp presented on a panel called “New Concepts for Enhancing Interiors,” which proved to be a great platform to introduce Huemen, launched this spring, to a broader audience. He shared the important role that design plays in delivering the “soul” of a brand and creating in-car experiences. To illustrate these points, Philipp talked about Configurable Entertainment and Voyager NEXT as car audio innovations that rely heavily on design to address consumer demands for personalization and next-level entertainment experiences. 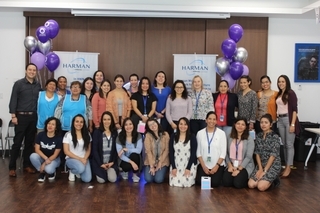 To top off a successful day, the winners of WardsAuto 10 Best Interiors Awards were recognized during the conference and six out of the 10 awarded vehicles feature HARMAN branded audio. In particular, the Lincoln Navigator was lauded for its “spectacular” sounding Revel system. For the Lexus LS 500, the judges praised the look and feel of the audio control knobs of the Mark Levinson system – designed to mirror the design cues of the Mark Levinson home audio line -- saying they were “like something you would find on a high-end home audio system.” The new 19-speaker premium Harman Kardon audio system in the Ram 1500 also received a mention on stage. As always, the WardsAuto Interiors Conference was a great opportunity to network within the industry and share some of the exciting work in which HARMAN is engaged, while getting a sense of how the industry as a whole is innovating during this inflection point in automotive transportation. With many thought leaders talking about designing for people and experiences instead of technology and devices, it’s clear that a new world of mobility is just beginning.